Do you know this sculptor and his work? He’s in tune with Africa and it’s animals. 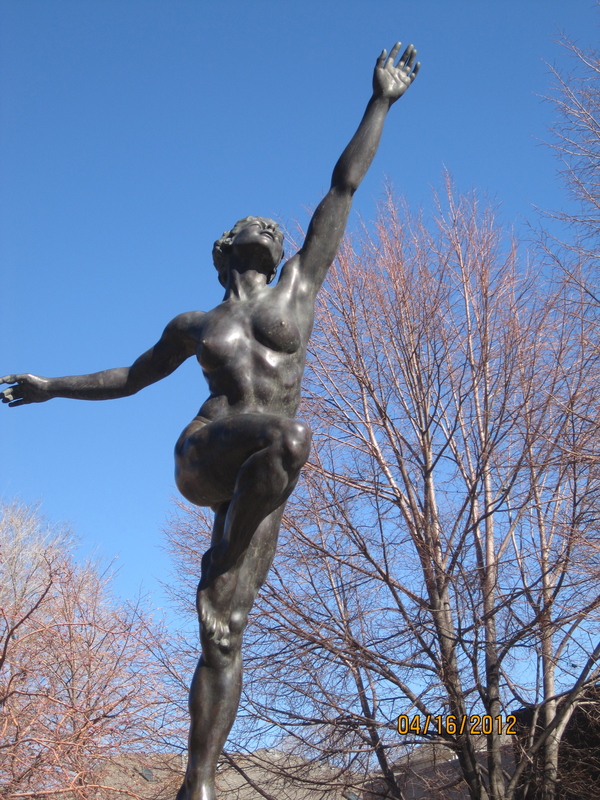 Known as one of Denver’s classic sculptors, who most assuredly will go down in the pages of Colorado and American art history. His studio is in LoDo. Ticket to Colorado History Museum to first correct answer. This combination of confrontation, wit, ferocity, self-examination and intelligence remain exceptional qualities in American poetry, even today. However, since his death in 1997, Allen Ginsberg’s celebrity overshadows his poetry. No wonder. He was arguably the most public poet in all of American history. He was the award-winning counter-culturist, a pioneering leader on gay rights, an outspoken opponent of the police state and its techniques of lies, repression and censorship, the godfather of spoken word and street poetics, a teacher and supporter of up-and-coming poets and artists as well as a spokesman for neglected peers. He was a conscientious objector, the practicing Tibetan Buddhist who never quite left behind the pragmatic chutzpah of his native New Jersey, or his Judaism, emerging in the 1960s as an often interviewed advocate for far-left progressivism in an age of American reactionary politics. These days Ginsberg’s poetry isn’t completely neglected. But its content and range are subsumed by the legacy of these famous interests, many of them propagated in documentaries over the last few decades and even in film adaptations of his life, like the recent Howl (2010) and On the Road(2012). At first glance, Beat Memories: The Photographs of Allen Ginsberg at the Grey Gallery seems like yet another nostalgic trip that will further eclipse the poetry. In actuality, this exhibition of 94 black-and-white photographs, taken by Ginsberg in the periods 1951–1963 and 1984–1996 offers a chance to reassess Ginsberg as an introspective poet who cultivated patient and caring witness even as he lived forcefully and at large. Overall, the photographs reflect a documentarian’s attention to an epoch’s unpredictable arrival and then, more subtly, an equal and more complicated attention to that same generation’s fadeout. Because I began viewing the show at the wrong end of its neatly curated timeline, the first picture I saw was a harrowing portrait of Ginsberg’s aunt near death in late 1980s, followed by a photograph of his lover Peter Orlovsky, seated alongside his family near a social welfare office on Long Island. Ginsberg’s portraits of Orlovsky are highlights of the show as they correspond to the changes of period and lifestyle, permutations reflected in Orlovsky’s mysterious shape-shifting appearances. He emerges as muse and marks the site at which Ginsberg’s private life bleeds into the public. Ginsberg’s almost paternal pride in the poet Gregory Corso is a subject of a number of photographs. Ginsberg discovered Corso shortly after the latter had served a three-year stint in Clinton Prison for theft. A serene photograph shows a seated, confident Gregory Corso — his overcoat draped over his shoulders, his hand holding a curtain rod like a weapon — underneath a sunlit window frame in a Parisian garret. The image provides a startling contrast to a close-up of a tired and rotund Corso which Ginsberg snapped in the mid 1990s at Kettle of Fish bar. Similarly, two separate photographs of Jack Kerouac crystalize the peripatetic drive of these young poets and writers long before they had been loaded down with the media label “Beats,” a label that curator Sarah Greenough expediently if unfortunately perpetuates in the exhibition’s title. The vitality of their youth is hard to miss. Even the young Ginsberg living through it sensed its inimitability. A rooftop photo of clean-shaven bespectacled Ginsberg taken by William Burroughs shows the poet against a backdrop of television antennas, chimneys, and skyscrapers. A photo of Jack Kerouac shows him mugging an “Om” as he strolls by Tompkins Square Park in 1953, and, in another, from that same year, Kerouac is in profile, silhouetted against the granular wood boards of the Staten Island Ferry pier, like an extra from Kazan’s On the Waterfront. Allen Ginsberg, “Jack Kerouac wandering along East 7th Street after visiting Burroughs at our pad, passing statue of Congressman Samuel ‘Sunset’ Cox, ‘The Letter-Carrier’s Friend’ in Tompkins Square toward corner of Avenue A, Lower East Side; he’s making a Dostoyevsky mad-face or Russian basso be-bop Om, first walking around the neighborhood, then involved with The Subterraneans, pencils & notebook in wool shirt-pockets, Fall 1953, Manhattan.” (1953). Gelatin silver print, printed 1984–97, 11 1/2 x 17 3/4 in. (29.2 x 45.1 cm). In hindsight, those two youthful photos become a prologue for Ginsberg’s wrenching 1964 photograph of a candid, disheveled Kerouac slumped in an easy chair surrounded by luggage in the poet’s East 7th Street apartment, staring away from the camera as if in self-disgust. The now world-famous Kerouac looks, in the captions scrawled by Ginsberg, like “WC Fields…red-faced corpulent shudder with mortal horror.” Here, the photo seems to say, are the strange fruits of fame. Although the exhibition is crowded by some already iconic images, like novelist Paul Bowles seated barefoot on the ground in Tangier looking up from a bowl and spoon, the show’s strongest appeal is the incidental and often euphoric moments that Ginsberg preserves: Orlovsky sky-high as he cannonballs upside down into a pond in Cherry Hill; Poet Gary Snyder, crew cut and priestly robed, flashing an ironic yet innocent gaze from a lush Kyoto garden; Keith Haring, like a schoolyard showman, drawing on a sidewalk in Lawrence, Kansas; Lou Reed backstage at the Public Theater unwittingly gazing in the precisely opposite direction of Samuel Beckett’s visage on a nearby playbill. A few photographs transcend their well-known subjects and suggest that had Ginsberg decided to give up writing poetry, he might well have made a run at being a full-time, master portraitist. And like the cameraman himself, the pictures traverse the globe: Japan, India, Morocco, Paris, Zurich, New York, Yosemite, San Francisco. A self-portrait reflected through multiple angles and mirrors taken at an optometrist’s office in the 1980s exhibits an almost indescribable facetiousness, much like Ginsberg’s long-distance shot of a skinny, isolated and atypically vulnerable William Burroughs, his boney head bowed under the spotlights as he prepares to be filmed for an interview. Burroughs is perhaps the most overexposed subject of the photographs, but there are fortunately many surprises. Allen Ginsberg, “Francesco Clemente looking over hand-script album with new poem I’d written out for his Blake-inspired watercolor illuminations, we’d done two books before; entrance corner of his loft overlooking Great Jones Street Manhattan, October 1984. He liked this picture.” (1984). Gelatin silver print, printed 1984–97, 15 7/8 x 10 5/8 in. (40.4 x 27 cm). A marvelous picture of the painter Francesco Clemente shows him seated in front of an oversized book his head half in shadow as sunlight plays upon the bare wall behind him. Clemente looks like a Benedictine monk transposed into a still from a Godard film. A photograph of the poet’s elderly grandmother, Rebecca Ginsberg, is aimed upward from the dining table, its stylized, enclosed composition stripping any sentimentality from the homey setting. The woman’s white blouse, white curtain and white tablecloth intensify the darker surfaces, evoking a paradoxical absence within her aged presence. Or is it the absence of Ginsberg’s long-mourned mother that haunts the photo? At their best these pictures show how photography is a celebration within a rite of mourning. And if photography prolongs a lived moment that vanishes as soon as it arrives, Ginsberg sensed how better suited photography than writing can be to that impulse. The self-portraits punctuate the exhibition without competing with the portraits, so that Ginsberg appears, and ages, at steady intervals, like an affable but unobtrusive host at a party floating in and out of rooms. These self-portraits, which tend toward comedy and eroticism, in the later pictures are marked by Ginsberg’s almost desperate need to show off his body as an avatar of impermanence. There are also flashes of playful narcissism: who else but Ginsberg would attire himself in an expensive Irish tweed suit and florid Oleg Cassini tie while making note that he got the latter from a goodwill shop? In contrast to his famously hyperbolic statements about his generation, these photographs seem like a secret visual diary filled with more complex realizations about his life and times, a quality underscored by the meticulous and poetic captions Ginsberg supplies beneath the prints. For instance, the late middle-aged painter Larry Rivers, dressed in a sleeveless T-shirt in a large Southampton studio after a weightlifting session, is captured looking more perplexed than self-possessed. A homeless, bearded and straggly Harry Smith, the ethnomusicologist, recovering from having nearly been run over by a car, sits with head bowed at Ginsberg’s table, withdrawing from the camera’s attention. Smith’s wild gray hair and drawn, severe facial features lend him a grandeur at odds with his victimhood. I sense Ginsberg took the photo because the moment was beyond words. Perhaps the most evocative portraits in the show are those without Ginsberg or anyone else in them, particularly a series capturing the Lower East Side streetscape looking north from Ginsberg’s longest residence at 437 East 12th Street. In one such vista, a sunflower competes with the view while in another a layer of snow encrusts the tenements and fire escapes. In yet another, a rainstorm has passed and the poet’s caption describes the backyards as a “walled undersea Atlantis” with “waving ailanthus, ‘stinkweed’.” That photo’s focal point might easily be missed where it not for Ginsberg’s note: the raindrops on a clothesline. Ginsberg’s caption quotes his Buddhist mentor Chögyam Trungpa Rinpoche: “Things are symbols of themselves.” As I trained my eyes on the clothesline, I felt the presence of Ginsberg more strongly than at any point during the exhibition. It was the invisible poet, at home, pointing out the rope strung between buildings, spotted by a row of raindrops about to fall. Beat Memories: The Photographs of Allen Ginsberg continues at Grey Art Gallery through April 6. I am flabbergasted. 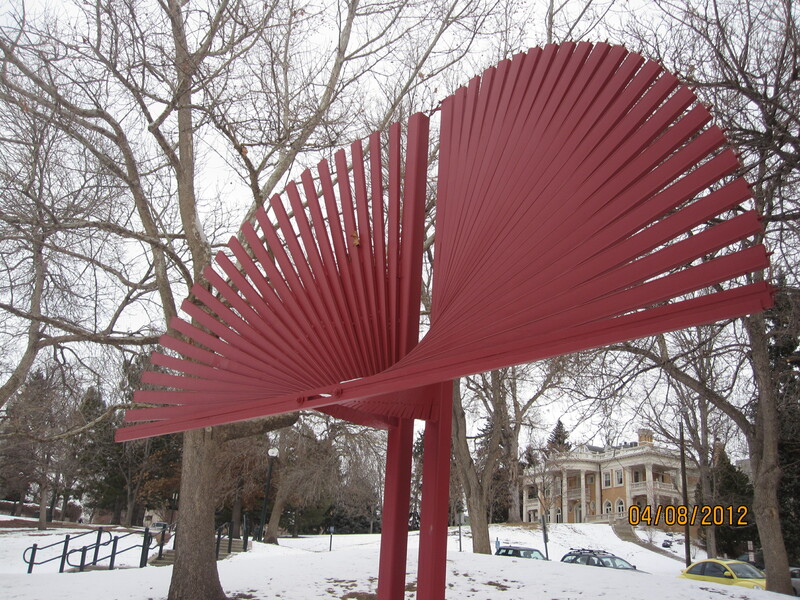 No one knew the answer to last week’s random public sculpture. You can still win the ticket to The Kirkland Museum, so go on, give it an educated guess. 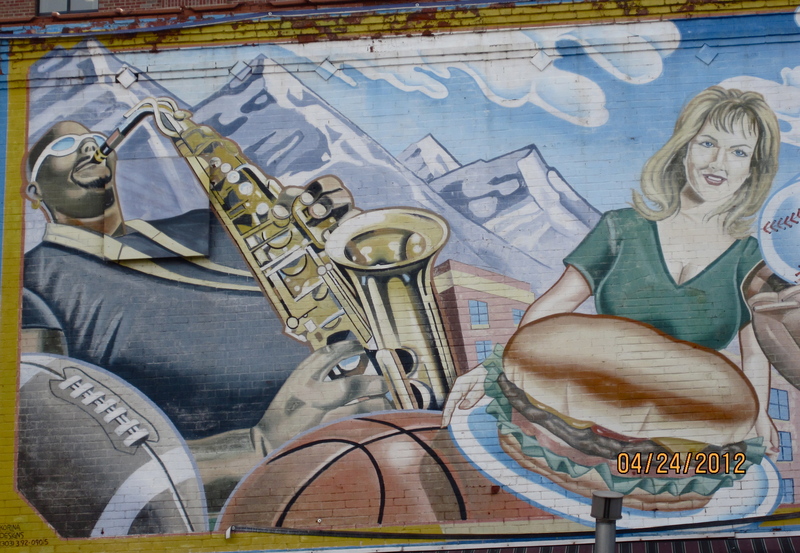 The mural could be in Jackson Square. First person to get the building and street correct, I’ll send you a ticket to the Museum of Contemporary Art / MCA. This is the cutest most clever photo shoot project I’ve seen in a long time. It was sent to me via email. I always wondered…finally the truth reveals itself. the artist created hilarious explanatory photo series titled “How to Make a Baby”. traditional cabbage and the stork stories. Opening night February 26 – March 10, 2013. I was invited to the Littleton Town Hall Arts Center Theatre last night for the beloved musical, “Forever Plaid.” The stage is intimate and cozy and so is downtown Littleton. What a quaint, little mecca Littleton is. Last night’s performance of this favorite 1950’s era show was delightfully fun, well choreographed and the casting superb. Frankie, played by Mark Middlebrooks; Jinx, Barret Harper; Smudge, Jacob Villareal; Sparky, Tim Howard, made up the four Plaids . 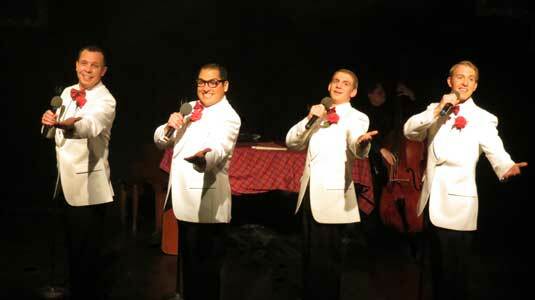 Each in their own right exuded the polish and talent of well-trained, experienced performers. Musical Director and pianist, Donna Debreceni, pounded the ivories with pizzaz and was accompanied by Austin Hein on the Bass. The small ensemble was tight including the singers who took control of the stage, the vocals and shananigans . The re-enacted Ed Sullivan Show was a hoot. It was a fun evening. L to R: Frankie, Smudge, Sparky, Jinx. Get acquainted with Littleton and sing your heart out to Crazy Bout Ya Baby, Sixteen Tons, Catch a Falling Star, Caribbean Plaid (Day Oh song), Shangri-La, Rags to Riches , Love is a Many Splendored Thing, among others. As we were leaving humming and singing softly, our aisle companion looked at us, smiled and shrugged, “These were all the songs we listened to in college.” Bless her heart, it was a wonderful evening of theatre, laughter and song. FOREVER PLAID runs through February 10, that’s tomorrow. Catch the last performance at 2:00 p.m. tomorrow. Last week’s art contest was a little difficult but you guys came through. Congratulations to Laura Phelps Rogers who correctly identified the contemporary work of Dr. Abe Vigil, titled, “Valedictorian,” 1972, at Governor’s Park, Pearl and 7th Avenue. 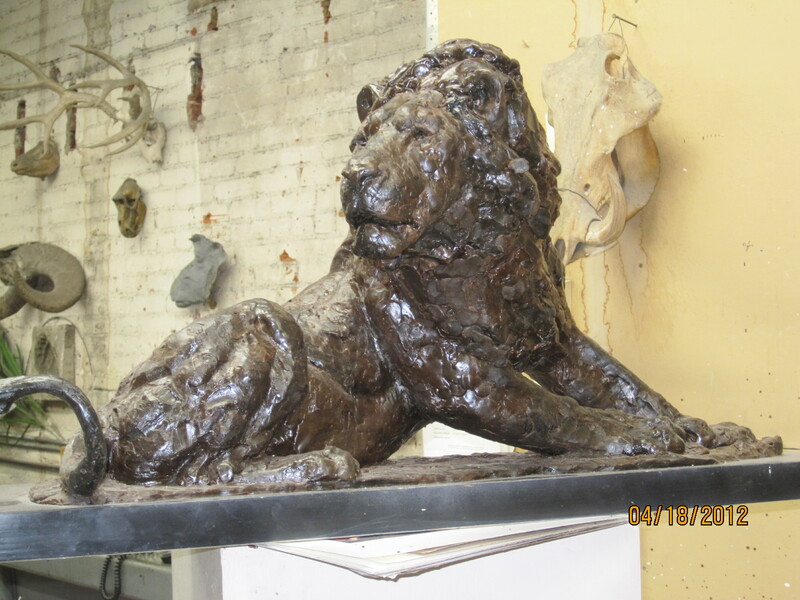 Here’s the clue for this week’s mystery sculpture’s title, artist, and locale. Great pickings here where the fruit hangs plentiful, lush and high. And the art world soars financially. 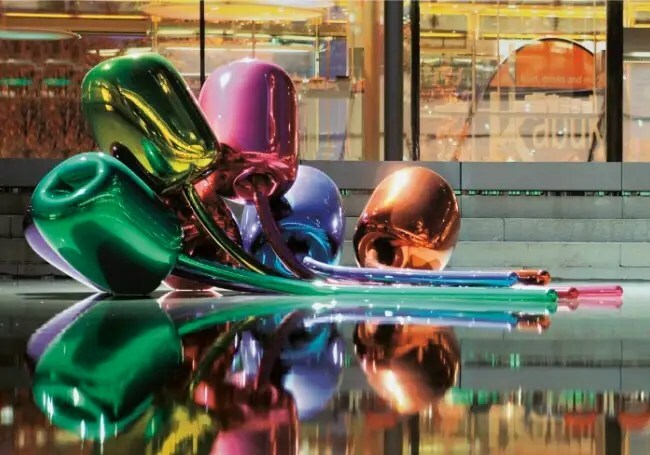 Jeff Koons’ giant steel sculpture “Tulips” sold to an anonymous buyer for $33.7 million during Christie’s post-war and contemporary art sale last fall. It turns out the buyer was hotel mogul Steve Wynn, who unveiled the three-ton sculpture in the rotunda of the Wynn Theater in Las Vegas last week, The Las Vegas Review-Journal reported. Wynn is a prolific art collector. He was rumored to have spent $40 million on Dale Chiluly’s glass-blown masterpiece “Fiori di Como, which hangs from the ceiling of the lobby at the Bellagio, and spent a record $12.8 million on a pair of Chinese vases to display in his Macau resort. He also notoriously put his elbow through Picasso’s “Le Rêve,” for which he paid around $60 million. Scottsdale Center for the Performing Arts will present the 43rd annual Scottsdale Arts Festival on Friday, Saturday and Sunday, March 8–10, in Scottsdale Civic Center Park. Named one of the top arts festivals in the nation by the readers of AmericanStyle Magazine and “Best Arts Festival” by Phoenix New Times, the Scottsdale Arts Festival showcases nearly 200 jury-selected artists from throughout the United States and Canada who work in painting, sculpture, glass and ceramics, jewelry, photography and more. Works of art are available for purchase directly from the artists and through the Festival’s online art auction. Admission to the Scottsdale Arts Festival is $8 for adults, $5 for students and free for children 12 and under and members of Scottsdale Center for the Performing Arts and SMoCA. Parking and trolley service are free. A two-day pass is available for $12. Tickets may be purchased in advance through ScottsdaleArtsFestival.org or (480) 499-TKTS (8587), or at any Festival entrance on the day of the event. (Pets are not allowed, except for trained service animals.) 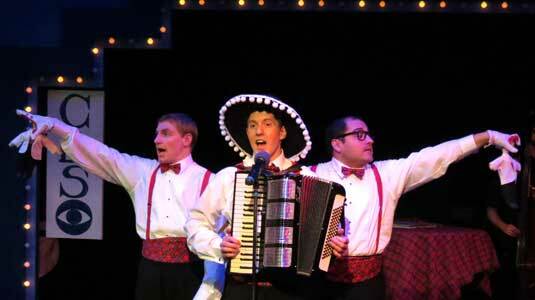 Proceeds benefit the programs of Scottsdale Center for the Performing Arts. Where is this piece of Art and Who is the Artist? The identity and locale of this piece will be more difficult than last week’s mystery art. O.K. art lovers prove me wrong. Children & dogs love to play here. Brides say Ooh, LaLa’s. First person to respond with the correct artist’s name and locale wins 2 tickets to the Vance Kirkland Museum.